100% Guarantee !, 0.5mm lead equivalency. 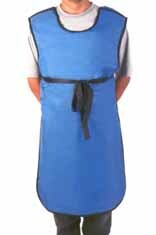 Available in REGULAR WEIGHT AND LIGHTWEIGHT OPTION, lightweight apron are 25% lighter than regular lead aprons. Utilize a high quality design to facilitate flexibility and comfort as well as full 0.5mm equivalency protection. Its unique design reduces weight and fatigue. 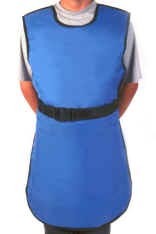 The 0.5mm equivalent lead an the blue vinyl with ties make this apron an exceptional savings. Available in 5 different sizes. 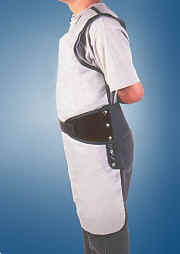 Distributes the weight from shoulders to the waist with the aid of a 6" elastic belt with velcro. Choose any exterior and color.